Soon to be a major motion picture starring Taraji P. Henson, Octavia Spencer, Kirsten Dunst, and Kevin Costner with a soundtrack by Pharell, HIDDEN FIGURES was adapted for film even before the book of the same name was finished. Wednesday, September 14, 3 p.m. ET Margot Lee Shetterly, the author of the inspiring and a largely unknown true story of the African-American female mathematicians at NASA whose work helped fuel some of America’s greatest achievements in space visits The Halli Casser-Jayne Show. In our second half-hour, our political roundtable, Four Broads Talking, with our smart and feisty team of pundits. 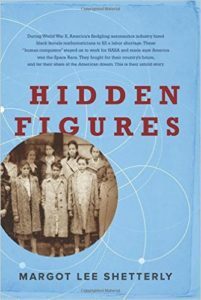 HIDDEN FIGURES is a story that combines the rich intersection of the Civil Rights era, the Space Race, the Cold War, and the movement for gender equality. At the core of the story are Dorothy Vaughan, Mary Jackson, Katherine Johnson, and Christine Darden the women “human computers” whose genius for numbers made space exploration and travel possible. Author Margot Lee Shetterly is the daughter of one of NASA’s first black engineers. She grew up in Hampton, Virginia, where she knew many of the women in HIDDEN FIGURES. With less than two months to go until Election Day, Donald Trump and Hillary Clinton are duking it out and Election 2016 is unlike any presidential contest that we’ve seen before. 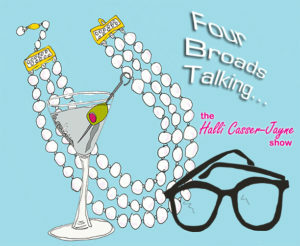 Oh what fun our FOUR BROADS TALKING™ panel of brilliant political pundits will have when they sit down for our weekly chat on all things politics and culture in our second half hour. Look for sparks to fly with this tell it like it is panel Sheila Weller, Lisa Schiffren, Suzanna Andrews and your host, Halli Casser-Jayne. Civil rights, NASA, mathematicians, astronauts, space, books, movie, women, Black Lives Matter, politics, The Halli Casser-Jayne Show has it all, Wednesday, September 14, 3 p.m. ET. For more information visit Halli Casser-Jayne dot com.